Media captionMina Justice's son Eddie sent her texts. He was later confirmed dead. 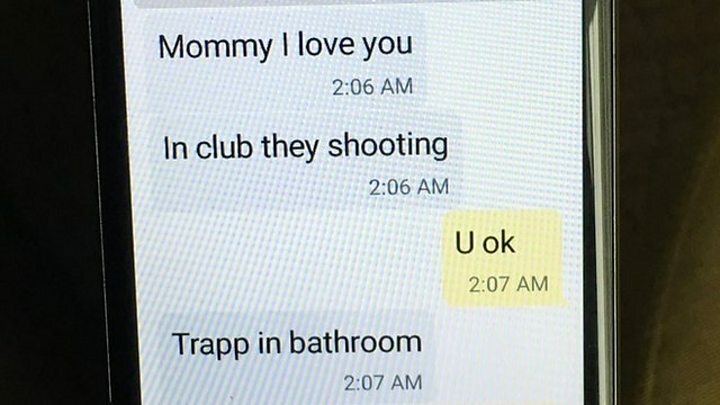 Eddie Justice sent a series of terrified texts to his mother from a bathroom as the gunman made his way through gay nightclub Pulse in Orlando. His mother searched for him and shared his texts over the following day but his name has now appeared on the list of those killed. Image caption Orlando's police department has issued a statement saying that this was "probably the most difficult day in the history of Orlando"
The 30-year-old was one of many held hostage in the Pulse nightclub on Sunday morning. Forty-nine people have been killed and 53 injured so far in what has become the worst mass shooting in recent US history. On Sunday police said 50 people had been killed, but on Monday they revised the figure downwards to exclude the gunman from the death toll.